Farmers' markets in Kentucky are growing more than just local produce across the Bluegrass. More than $10 million in sales will go back to farmers and in turn into the local economy this year. "In 2011, markets reported $10.5 million in gross sales, but I'm sure this number would be very close if not over $11 million if all markets collected and reported their annual gross sales," explained Sharon Spencer, farmers' market specialist with the Kentucky Department of Agriculture. Kentucky farmers' markets have seen steady growth over the last few years. In 2009, markets reported sales of $5.6 million and then sales increased to almost $8 million in 2010. "This year, the weather conditions this summer have taken a toll on our farmers at the market. It has not been a good year for beans and corn, but the diversity of products at the market is what has made the difference for sales," said Jeff Dabbelt, executive director of the Lexington Farmers' Market. "We have great farmers producing niche products like artisanal cheeses, wines, pasture eggs, and organic meats along with a great selection of seasonal products that bring customers out to the market each week." Spencer explained that the diversification at the farmers' markets has happened as farmers have had to diversify to stay on the farm. "When farmers started losing their tobacco quotas 10 years ago, they began looking for ways to replace their tobacco income," Spencer said. "Many farmers turned to producing products they could direct market to the consumer. This necessity to change along with the trend in the local food movement has led to the growth and diversification in farmers' markets across the state." Traditionally, farmers' markets in Kentucky have been open only in the spring and summer, but growing interest in local food and diversification on the farm have led many markets across the Bluegrass to extend their season. Kentucky now has three markets open year round, providing customers the option to buy fresh meats, eggs, processed foods, and produce through the cold winter months. "We had our best winter market this past year. We had more members participate and, according to members, many saw sales greater than in years before," said Dabbelt. "I had one producer tell me that he sold $250 in product one winter Saturday before 10 a.m. While sales like that are not normal for the winter market, we hope that they are one day." In the peak of the summer, it is easy to see the variety that can be purchased in the market, but if consumers are willing to try new items, there are great products year round, such as greens, winter squash, sweet potatoes, meats, eggs, breads, ad other value added-products. "Having a good mix of vendors, both farmers and processors, has helped the Lexington Farmers' Market to grow year round," said Mac Stone of Elmwood Stock Farm, one of the many family farming operations that participate year round in the market. "We are seeing a lot of new faces, a younger crowd, at the market, who are concerned about the food they eat and how it gets from the farm to the plate. I think this growth is not only good for our market, but I think it is a positive sign for the local food economy beyond the market." 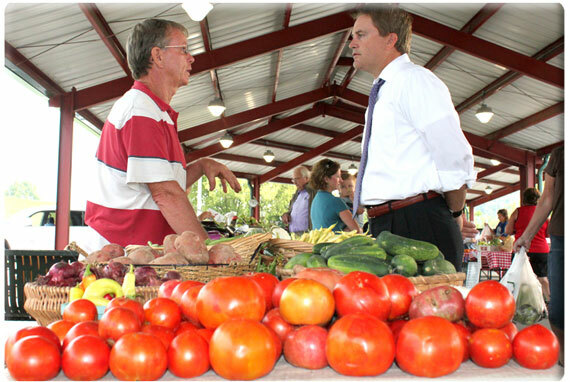 For a complete list of Kentucky's farmers' markets, along with locations and hours of operation, visit the farmers' market page on the Kentucky Department of Agriculture website.